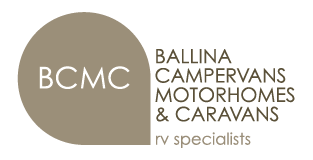 This website contains information, documents, pages, images and multimedia prepared by Ballina Campervan and Motorhome Centre (BCMC). While the information contained in this website has been formulated with all due care, BCMC does not warrant or represent that the information is free from errors or omission, or that it is exhaustive. The information is made available on the understanding that BCMC administrators and its employees and agents shall have no liability (including but not limited to liability by reason of negligence) to the users for any loss, damage, cost or expense incurred or arising by reason of any person using or relying on the information and whether caused by reason of any error, omission or misrepresentation in the information or otherwise. Furthermore, while the information is considered to be true and correct at the date of publication, changes in circumstances after the time of publication may affect the accuracy of the information. The information may change without notice and BCMC is not in any way liable for the accuracy of any information printed and stored by a user. Recognising that some of the information is provided by third parties, BCMC takes no responsibility for the accuracy, currency, reliability and correctness of any information provided by third parties, nor for the accuracy, currency, reliability and correctness of links or references to information sources (including Internet sites). These external information sources are outside the control of BCMC and it is therefore the responsibility of the Internet users to make their own decisions about the accuracy, reliability and correctness of information found on those external Internet links. Businesses/individuals registering their details on the BCMC website do so at their own risk, and the site administrators accept no responsibility for the use of any information provided by businesses/individuals to be displayed on this site. 3. BCMC will keep the information strictly confidential and will not disclose the information to any third party without your consent, unless required by law. Aside from use as permitted above or otherwise under the Copyright Act 1968, all rights are reserved. Material appearing on linked sites may be subject to third party copyright. BCMC cannot give any permission to use such material and strongly recommends that you refer to the copyright notices on those sites before making use of any such material. You may link to this site, but permission is restricted to making a text link without any alteration of the site’s contents. You may not use any of the logos or any other material from this site as a banner or icon without BCMC permission. Permission is not granted to reproduce, frame or re-format the files, pages, images, information and materials from this site on any other site unless express written permission has been first obtained from BCMC. BCMC reserves the right to prevent linking by giving notice. The nature of the internet prevents BCMC from guaranteeing the suitability or accuracy of any material that this site may be linked to. The providers of linked sites often have their own protocols and standards in relation to their sites. You should familiarise yourself with those protocols and standards. The above Disclaimer applies equally to the contents of linked sites and any goods or services purchased through them. The fact that a site is not linked to this website does not necessarily imply any non-endorsement or criticism of that site by BCMC. It is your responsibility to conduct your own investigations and enquiries and make your own decisions concerning the information retrieved from linked sites or goods or services purchased through linked sites.